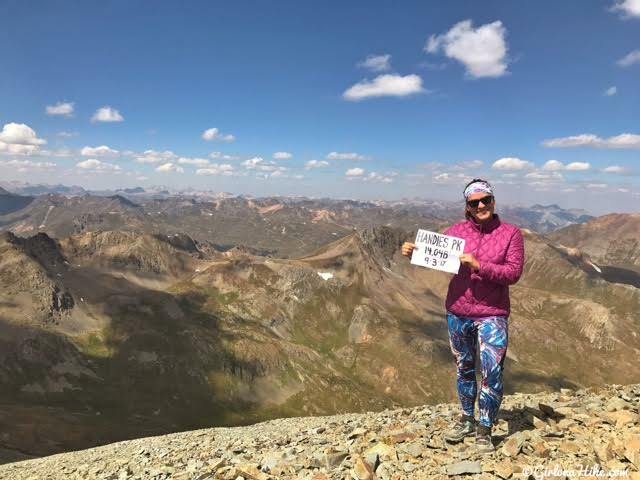 Handies Peak (14, 048 ft) is located near Silverton, Colorado and just happened to be my first "14er" I've summited! 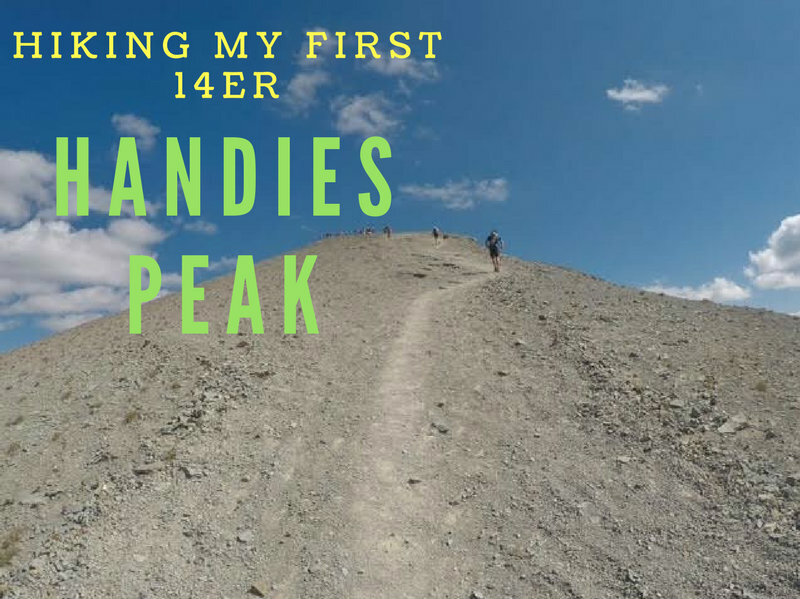 If you aren't familiar with that term, it just means you've hiked a peak that is over 14,000 ft in elevation. 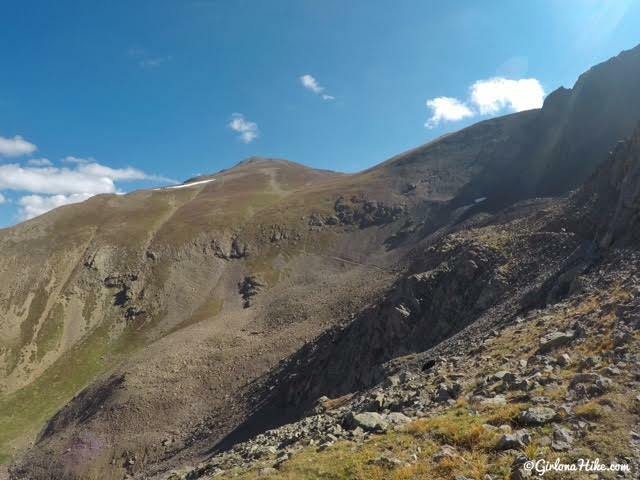 There are 96 "14ers" in the US, and Colorado has the most at 57! One down, 56 to go! Handies Peak is probably considered the easiest 14er, since it is only 7 miles RT and gains a mere 2,400 ft. 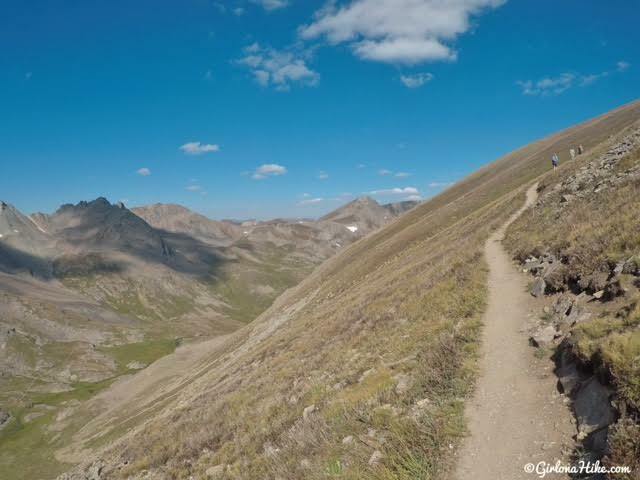 Compared to other 14ers, this is considered a short summit, there is no scrambling, a well defined trail to the summit, and therefore is quite popular. 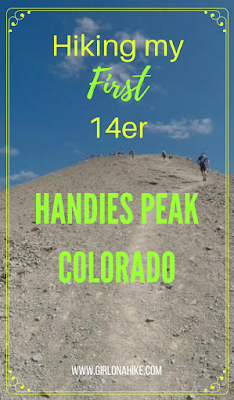 The hardest part about hiking to Handies? The elevation. 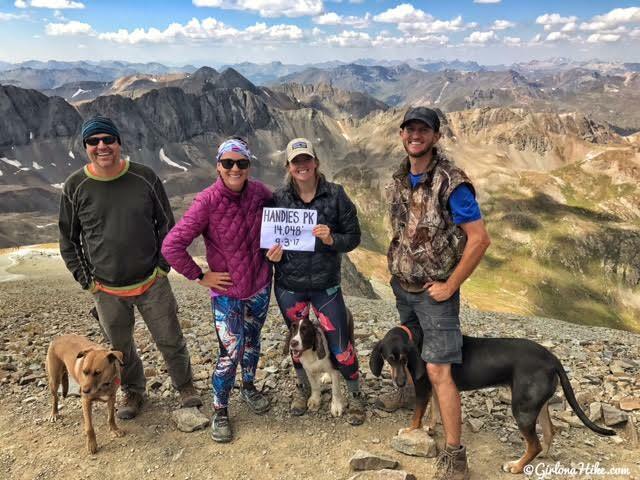 You start hiking around 11,600 ft, then summit at 14,048. 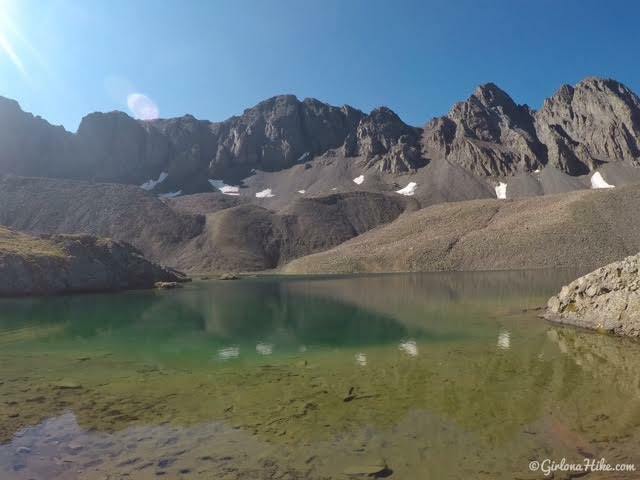 Because of this, some people experience altitude sickness or a shortness of breath. I have exercise induced asthma, and I really had to keep an eye on my heart rate and breathing so I wouldn't have to use my inhaler - I stuggled to keep my heart rate below 150. 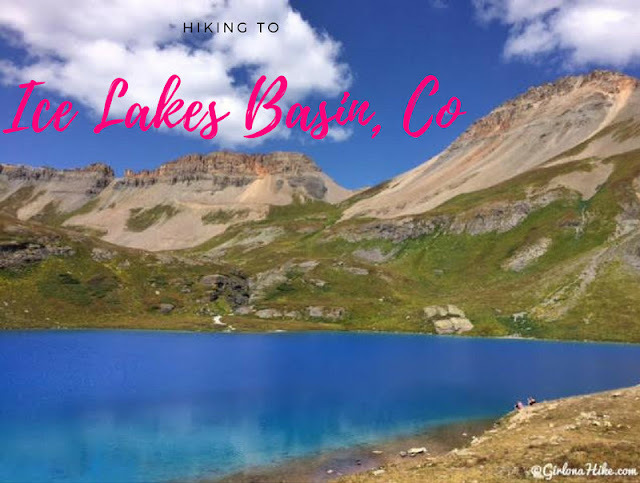 Even though my group of friends and I are used to hiking in higher elevations, we had never gone this high before so we just made sure to hike at a slower pace, take breather breaks, and drink plenty of water. Dogs are allowed off leash, and there is plenty of water for them to drink from, and they can even swim in Sloan Lake. I was surprised to see several children on the summit. 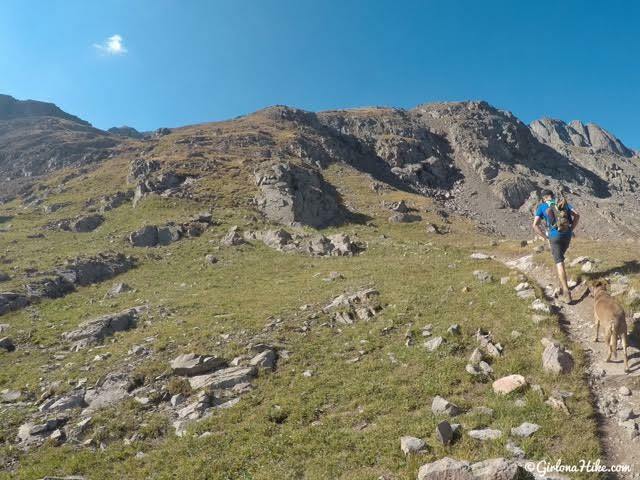 We met a father/son (8 years old) duo who regularly hikes big peaks together, and he had his own trekking poles, backpack, etc - it was so awesome to see! 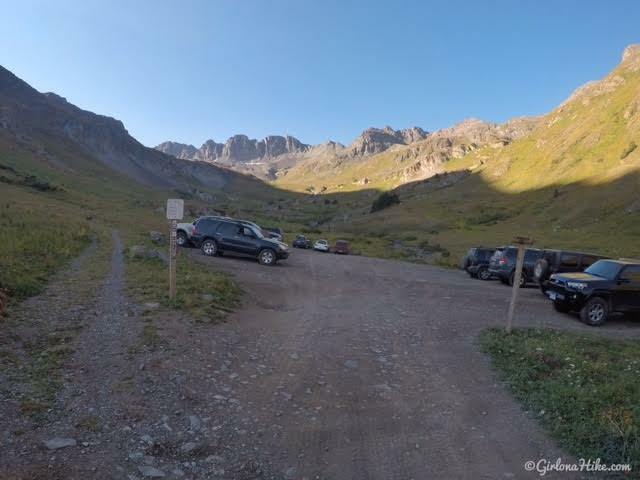 Use this map if driving from Silverton, CO. Since the GPS may not work with these dirt roads and when you lose service, here are the directions. From Silverton, CO head East on HWY 2 for 8 miles towards Animas Fork, CO. Follow all signs for Cinnamon Pass. 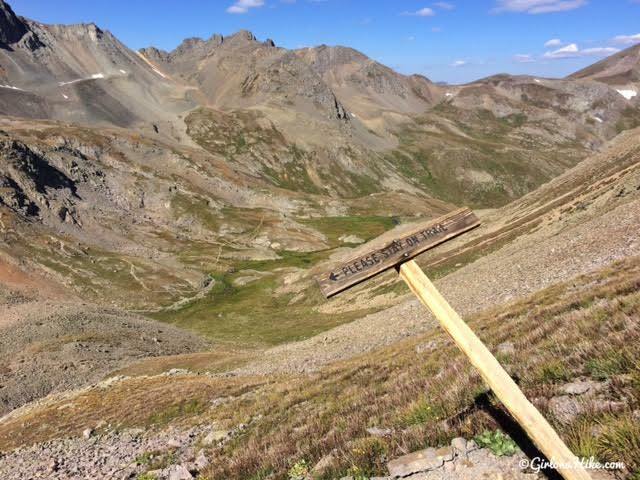 Once over the pass, continue on HWY 5 until you see the sign for American Basin. Drive to the very end of the road where the trail for Handies Peak starts. You WILL need a high clearance, 4x4, car past Eureka. As soon as you make the sharp turn for Cinnamon Pass the road gets really rough. 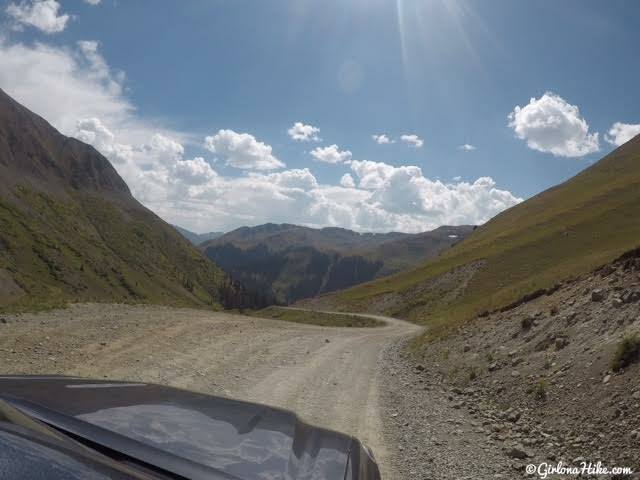 The drive from Silverton to American Basin will take about 1 hour 15-30 minutes. The road does require 4x4 drive - there are several warning signs. We had a Toyota Tacoma and that worked great. This is one of the nicer sections of the road. 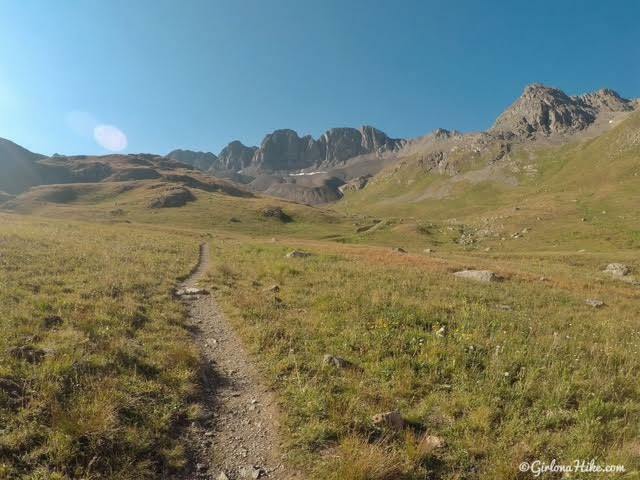 Follow Cinnamon Pass (HWY 5) road until you reach the turnoff for American Basin. 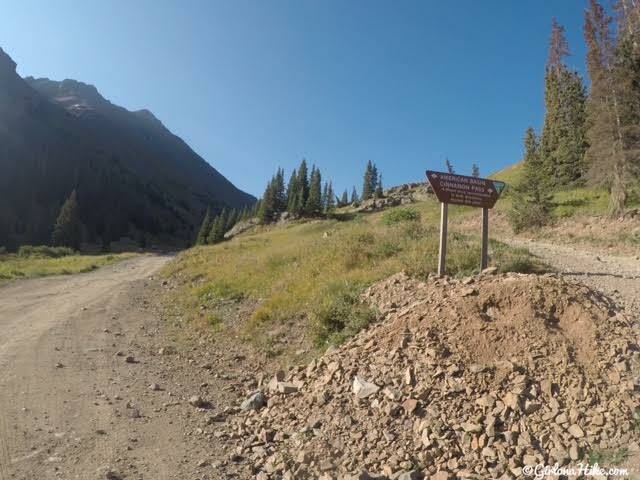 The trailhead starts at the end of the road in American Basin. You can also park further down the road then walk up. There is plenty of free, dispersed camping in the area. 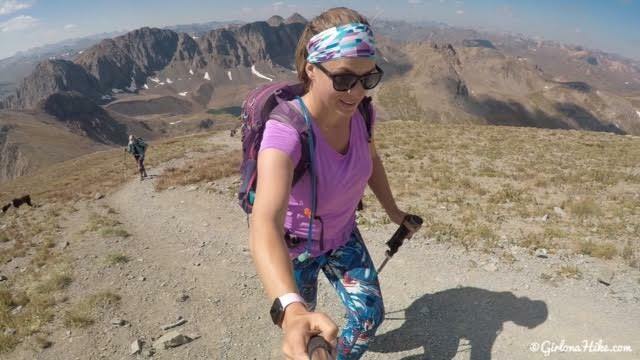 Backpacking is allowed on this trail. 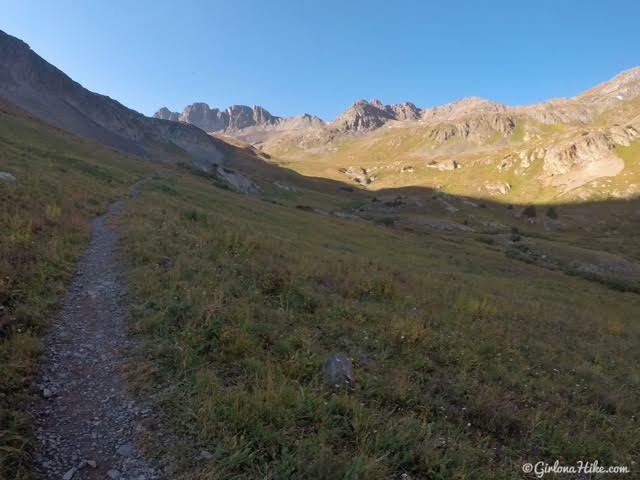 The trail starts by heading south, towards American Basin. Only 3/4 mile in and we needed a breather break! 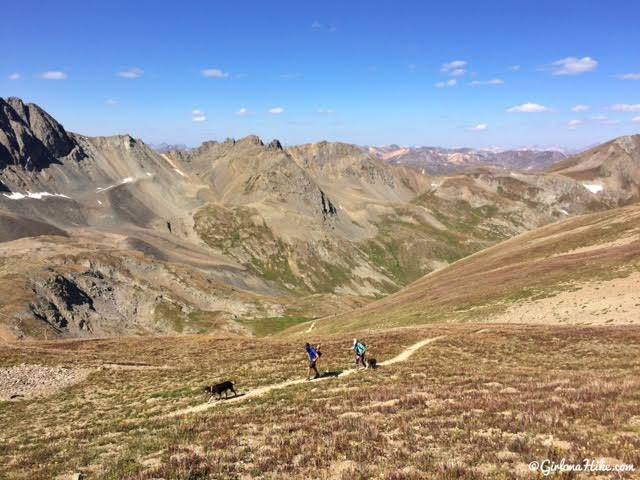 The views start to open around mile 1, then you will hike up a few small, steep switchbacks as the trail turns East. From this point, you should be able to see the false summit of Handies, just below the cloud in the top of the photo. The trail briefly turns South again, and up a steep hill. From Sloan Lake, you should be able to see the trail and people coming down. 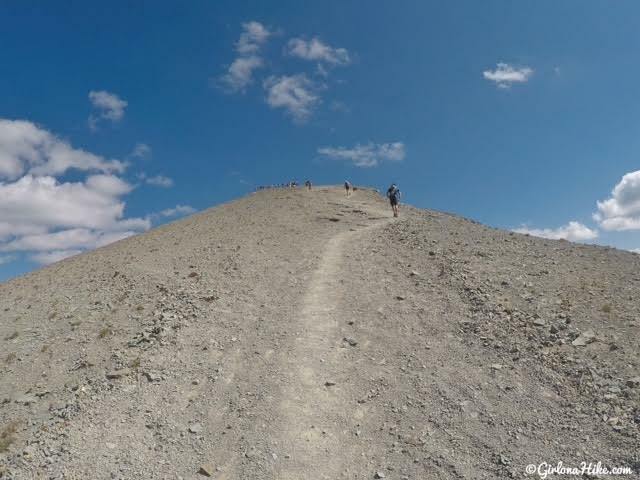 This section is rocky, and you will descend a little bit. You can clearly see the trail across there now. 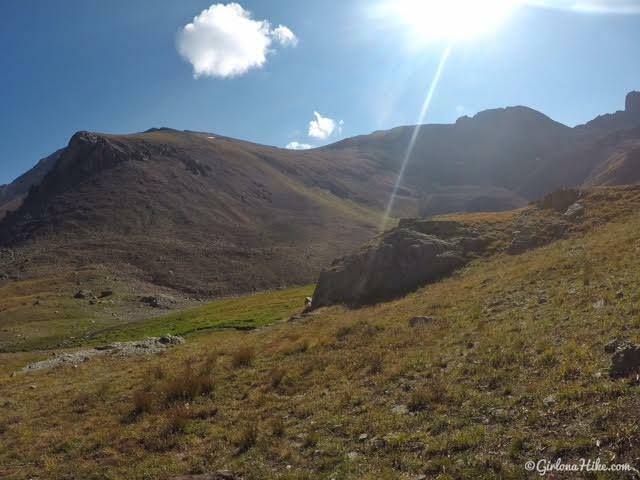 I guess there used to be an original/old trail to the summit. This has now been closed off for revegetation. Hike up a few long switchbacks. Looking down to my friends making their way up. 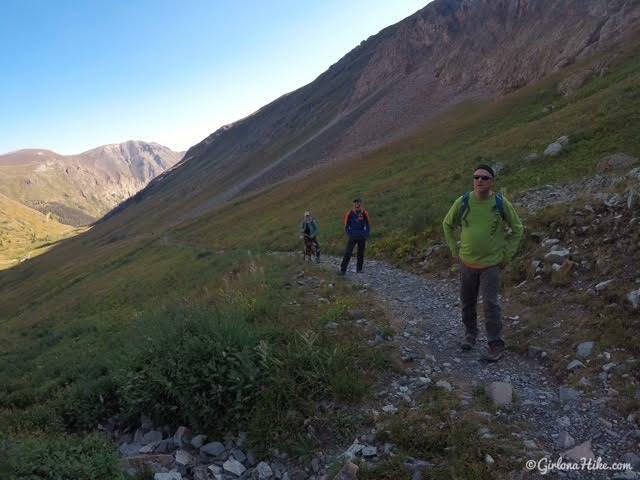 At the saddle looking into the East basin, Boulder Gulch! I've gotta be there by now, right?! On the summit with my buddies! 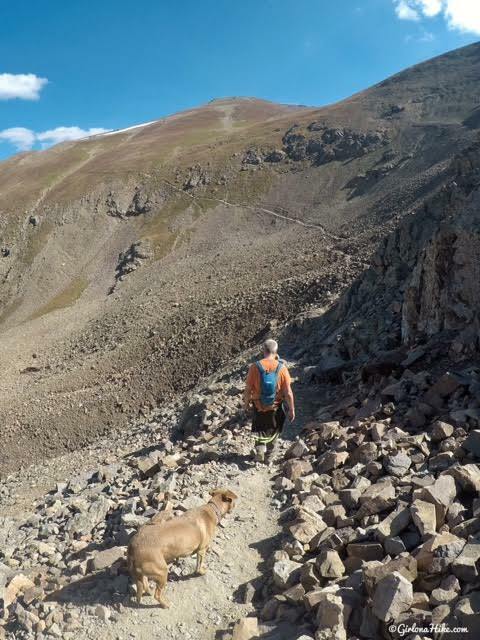 Poor Charlie had to miss out since he had a foxtail removed by surgery :( I was really looking forward to summiting together, but he stayed home with his dad to recover. 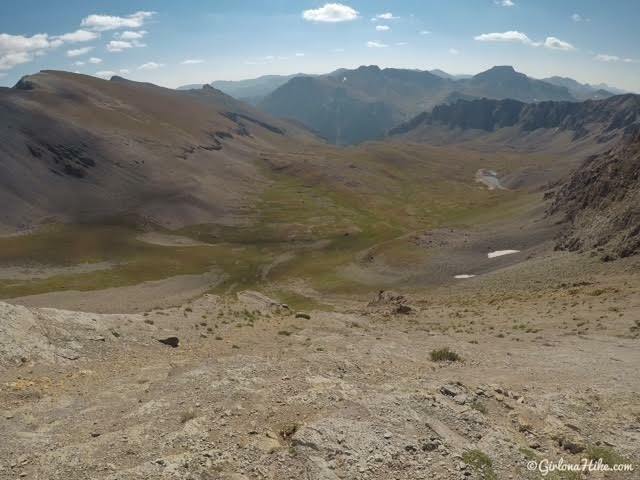 Looking North down into Grizzly Gulch - you could also take this route to summit Handies Peak. Both are about the same distance. Only 5 miles of a drive from Silverton, CO! Nice! I just did Handies a few weeks ago. 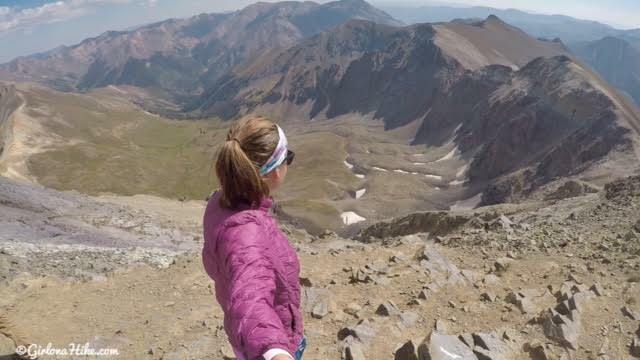 Next time you're in the area, look into Sneffels Peak. It's a little west of Ouray. Another "easy" 14er, but a bit more difficult than Handies. A little easy class 3 scramble at the top.